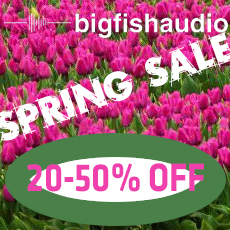 Big Fish Audio präsentiert mit Big Room Anthems eine Electronic Dance Music Library bestehend aus 15 Construction Kits, sowie Loops und Samples. Erhältlich ist diese in allen gängigen Formaten, als auch im KLI Format, für Nutzer von NI Kontakt. Big Fish Audio is proud to present Big Room Anthems. This library sounds absolutely massive in every way. Modern Compression techniques mixed with excellent sample content and recording quality combine to make a sound that is big enough for the club, the rave, the stadium and the arena right out of the box. Big Room Anthems is made up of 15 Kits packed with all the hooks, basses, drums and synths you need to create the next EDM chart topper. All samples are recorded in the highest quality 24-bit rate and have been meticulously formatted in the most widely usable Apple Loops, Acidized WAV, and REX formats. With each of the 15 included kits recorded at 128 BPM, EDM production has never been more easy or versatile. In this consistent BPM format, the possibilities for mixing and matching kits is near endless. Big Room Anthems puts the tools professionals use right into your hands in a format that is easy to use and quick to put together, a simple must have for any EDM producer.